Sol 1555, December 20, 2016. The Remote Micro-Imager took aim at a rock target showing a tile-like pattern of cracks that appear to be partly filled with minerals, likely deposited by water. 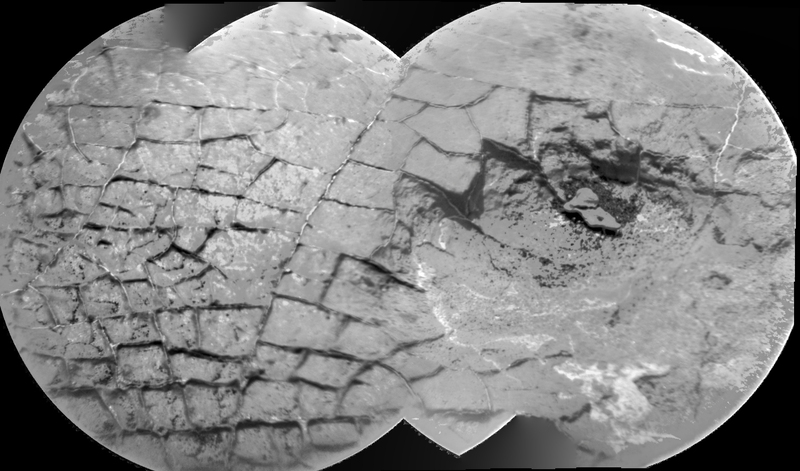 The right side of the four-frame composite shows a hollowed-out area, possibly due to differential erosion. Click image to enlarge. Sol 1555 raw images (from all cameras), and Curiosity’s latest location. This entry was posted in Reports and tagged Aeolis Mons, Curiosity, Gale Crater, Mars Science Laboratory, mineral veins, Mount Sharp, MSL, Murray Formation, NASA, Remote Micro-Imager, RMI, Stimson Formation. Bookmark the permalink.